Ghouls & goblins shrinking into spiders then flying away as bats. 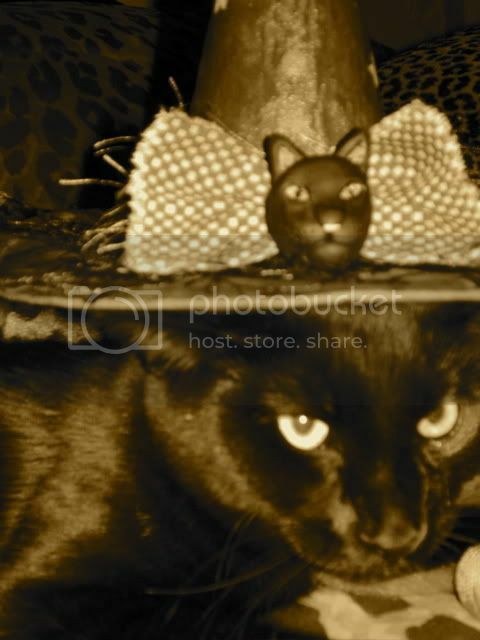 *Sepia tone photo of my new precious black kitty cat MAGICK. My Halloween gift from my sweet hubby Count Tomula. Well done sepia effect on your beautiful kitty! And thank you for the compliment! Hi Becky, thanks for your kind remarks. I just love my sweet kitty. Your artwork always makes me smile. Halloween may have past, but it's Halloween time every day here with all my SPOOKTACULAR OOAK artwork. Hi Lori, thanks for your kind comments. Isn't Magick adorable! He is such a Sorceress's little familiar too... He will be kissing me & suddenly he'll start chasing sprites & spirits. You know what I mean, cats have that sixth sense especially black cats. Yes, Becky sure can create lovely OOAK Halloween art. Lori, your art is also very original. You always have something really OOAK SPOOKTACULARLY different. That's what makes your art stand out. Great pic of Magick Lyndy! Love Becky's hat and the sepia tone!! Hi Chris, Magick sends kitty kisses... He is such a delight! DeVille our black German Shepherd loves him almost as much as I do. DeVille licks & cuddles him just like he was her baby. Becky's artwork is always wonderfully whimsical. I'm blessed to have so many special artist friends in our inner magickal circle. Thanks for your generous & spooky cool art gifts too, eventually I'll get all my gifts together for a special PICs Blogspot! Oh, the sepia effect was all Magick's trick. READY or NOT, he simply jumped on my computer & entered the sepia color I was working on. 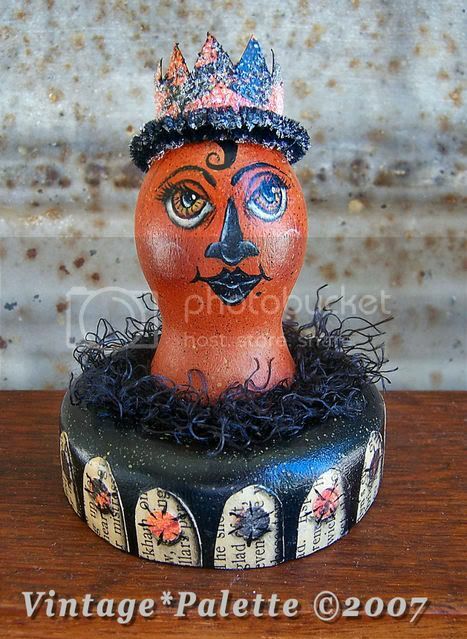 Lyndy, I think a pic gallery of your OOAK art on your blog would be really cool! Hi Chris, I'm trying to find just the right PIC/album to leave at the top of my Blog. Then I could down load PICs with titles. AND also add more albums on other topics like the Celebrity Look-A-Like Halloween party I went to. ANY album suggestions? Does Blogspot have photo albums we can down load? Yes, Magick really does have an inner artist. He just finished a new artwork he calls 'Paper Towel Confetti'! I don't know if Photobucket has an album option...will have to check into that...altho...you could have a rotating slideshow on the top of your blog and switch out pics as needed...this is what I do with my eBay ME page. Will keep you posted on the album option later on today! Hi Chris, I was thinking about that revolving photo album too... Just need to take the photos & decide on how to title them. I'm sure once I start doing this more & more I'll get the hang of it. Right now it takes forever & a day because I was the buyer/collector so I didn't have to upload anything. Now with the writing of my artbook, I'm photo inventorying everything as well. Thanks Lyndy on the Candy Cane Cats PC. I am getting SO excited about your forthcoming book, looking forward to more details!!! PPS: There is a title option in Photobucket for slideshows. Hi Chris, I'm excited too... Finally the art book's website: http://www.todaysgoldpublications.com/ will be up & running before the end of this year. Maybe even before Christmas. It's a flash site so it's really FANTASTIC & very MAGICKAL.